Healthcare organizations are undergoing major transformations to combat rapidly rising costs and reimbursement restrictions associated with the Affordable Care Act (ACA). With this legislation in mind, hospitals are strictly regimenting budgets across departments, and are actively seeking opportunities to minimize expenses. Oftentimes for healthcare IT (HIT) teams, these savings can come from examining and monitoring existing assets within their technologies or telecommunications portfolio, to uncover hidden costs to the bottom line. 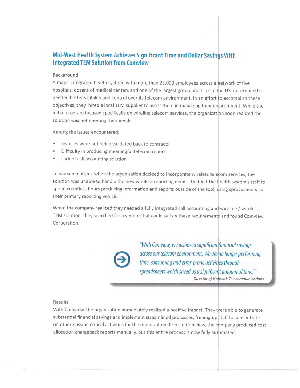 Don’t miss this latest case study, where the IT department of a major hospital in the Midwest with 23,000 employees, a network of five hospitals, and a dozen other outpatient medical centers, discovered an expenses and telecommunications dilemma for their newly integrated wireless system. This provider was unable to monitor their individual call records or produce accurate usage reports, ultimately resulting in major discrepancies between invoices and organization usage rates.